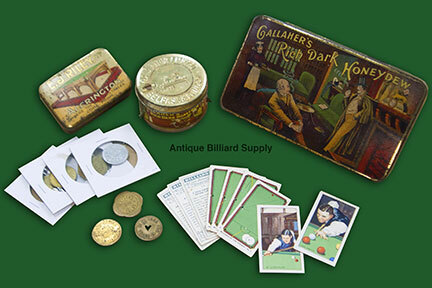 #10-20 Billiard collectables to compliment any antique billiard room. Tobacco tins with pool room scene on top and bottom side of lid. Tin match safe with similar graphics. Pool and billiard tokens good for free play at various pool halls and hotels. Scarce tobacco cards from the late 1800s with different billiard shots or pool players on each one.